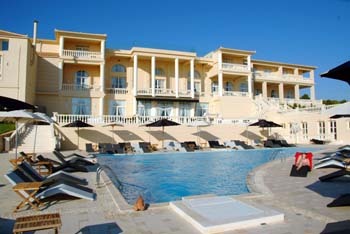 Situated in one of the most idyllic spots of the Ionian island of Zakynthos, the five-star Mabely Grand Hotel is built on a cape at merely 30 km from the local port and airport. Covering an area of almost 15 acres, the property affords splendid vistas of the beautiful island landscape and the immense blue of the sea. The hotel has 108 guestrooms – 32 rooms and 73 bungalows. Each guestroom is appointed with modern amenities including air conditioning, mini bar, satellite TV, safe, direct dial phone and hair dryer. Moreover, the 12 executive suites feature a private pool, and the Presidential suite has a private pool and uninterrupted sea views. 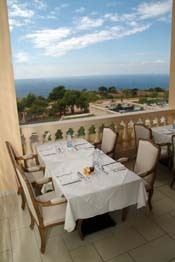 Guests can enjoy a vast range of local and international dishes during breakfast, lunch or dinner while taking in a unique view at the vast terrace of “Lydia” restaurant. The hotel’s bar “Noire” is a cozy meeting point with classic design, comfortable seating and discreet lighting. Cool drinks and cocktails are served at the pool-bar next to the main swimming pool. Greek specialties are uniquely prepared at “Byzantino” tavern for beautiful Greek nights. 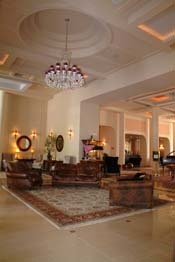 Guests can relax at the hotel Spa with anti-stress and reflex massage, face and body rejuvenation treatment. Mabely Grand Hotel is fully equipped to host any type of event, conferences, business meetings and product launches at a specially designated area capable of accommodating up to 350 participants. The conference area features a wide range of amenities, including comfortable seating, tables, projectors and screens.